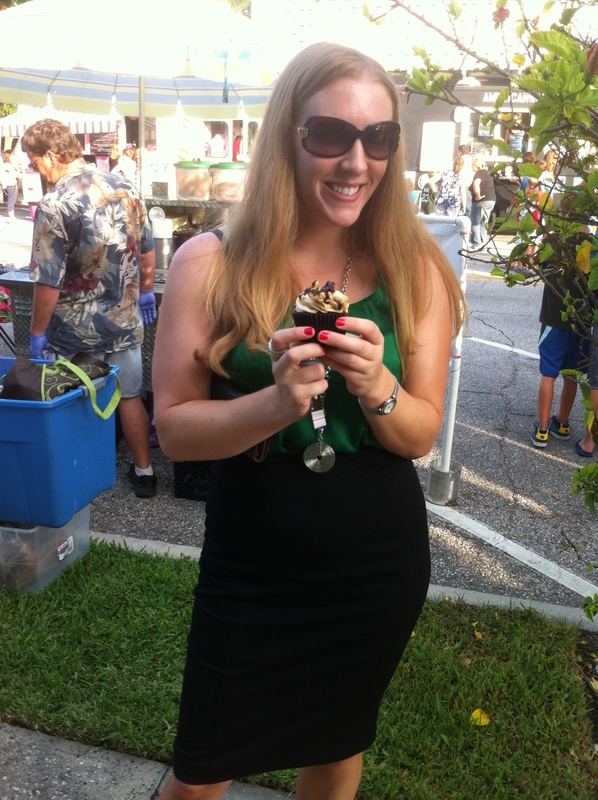 I love food truck rallies and am lucky that Tampa Bay has so many on a pretty regular basis. Last week, I had the opportunity to share my interests with a friend who had never been to a food truck gathering of any kind before. I chalked it up as another birthday celebration excuse as well. 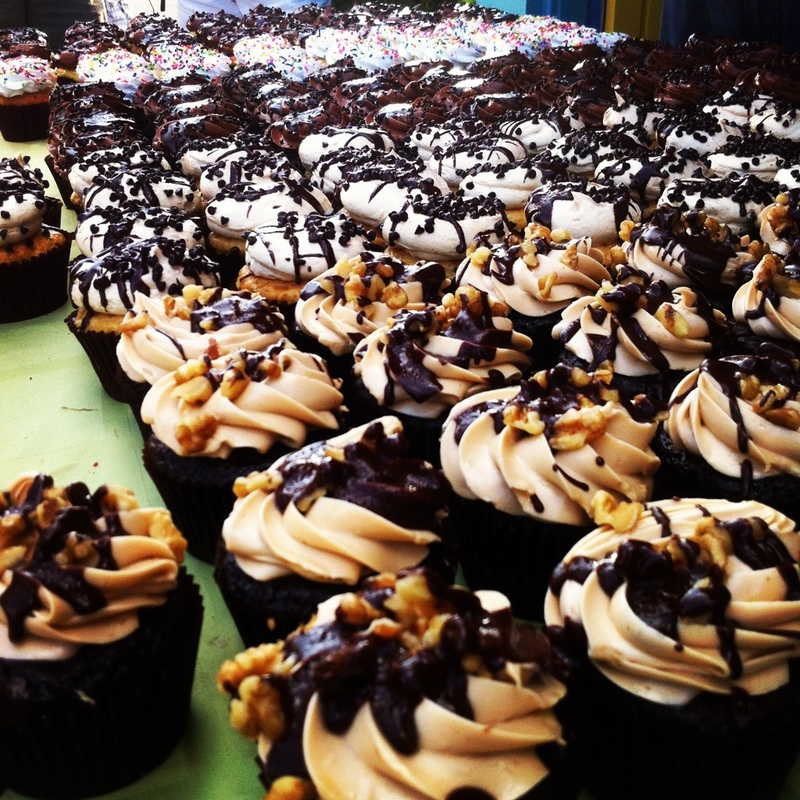 St. Petersburg Beach hosts a4th Friday Food Truck Festival each month on Corey Ave and my friend Alex and I decided to check it out, drawn in specifically by the promise of free cupcakes. We went straight from work to the festival so I was a bit overdressed in my blouse and pencil skirt, but at least I planned ahead enough to bring flip flops to change into since walking usually plays a big part in these. 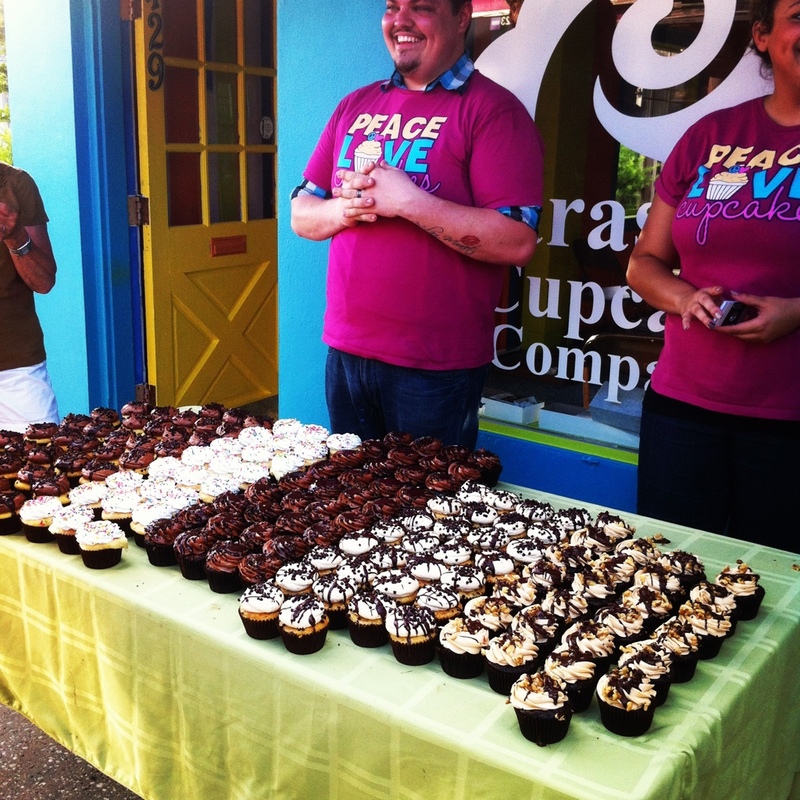 Our first stop was, of course, the free cupcakes, from Sarasota Cupcake Company who were sporting some cute “Peace Love & Cupcakes” shirts and big smiles as they offered a whole table of full sized cupcakes for our choosing. I opted for the turtle cupcake (chocolate cake, caramel type filling and the lightest buttercream peanut butter frosting sprinkled with pecans) and justified it by calling it a piece of my birthday cake. Once the dessert portion of the meal was done, we toured the selection of food trucks to pick out the one two we’d actually be tasting. For me, it was simple as there was only one that offered a good selection of seafood, Keepin It Reel. 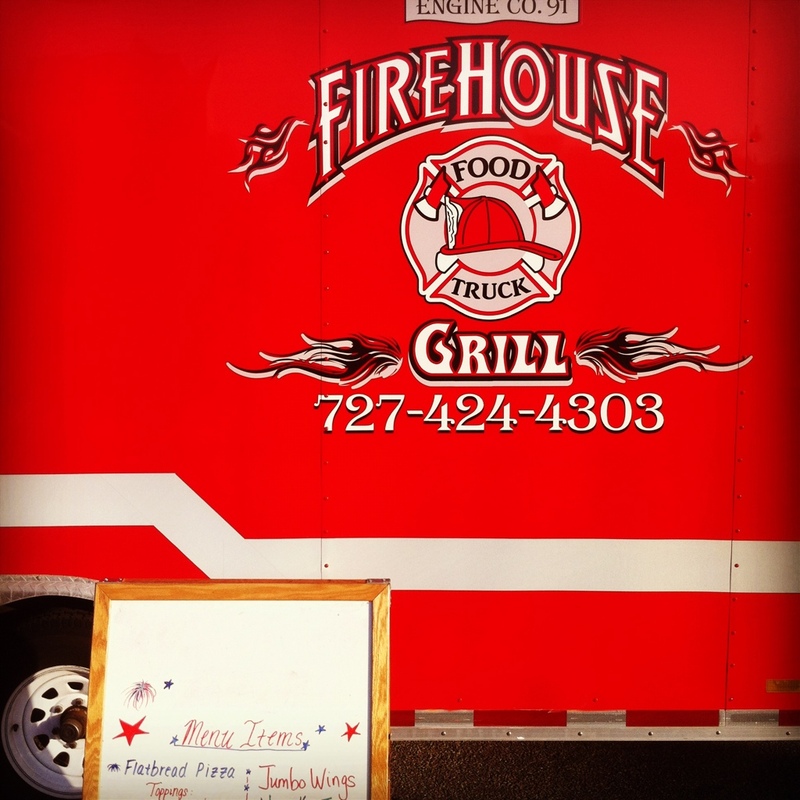 Before digging into the main course though Alex and I couldn’t resist toasted “cheese” ravioli’s at the Firehouse Grill food truck. The only problem with these was that one bite quickly revealed that they weren’t just cheese! Apparently they forgot to mention they have a ton of meet in them mixed in with the cheese. I quickly spit my bite out and was so bummed because they looked so irresistible. 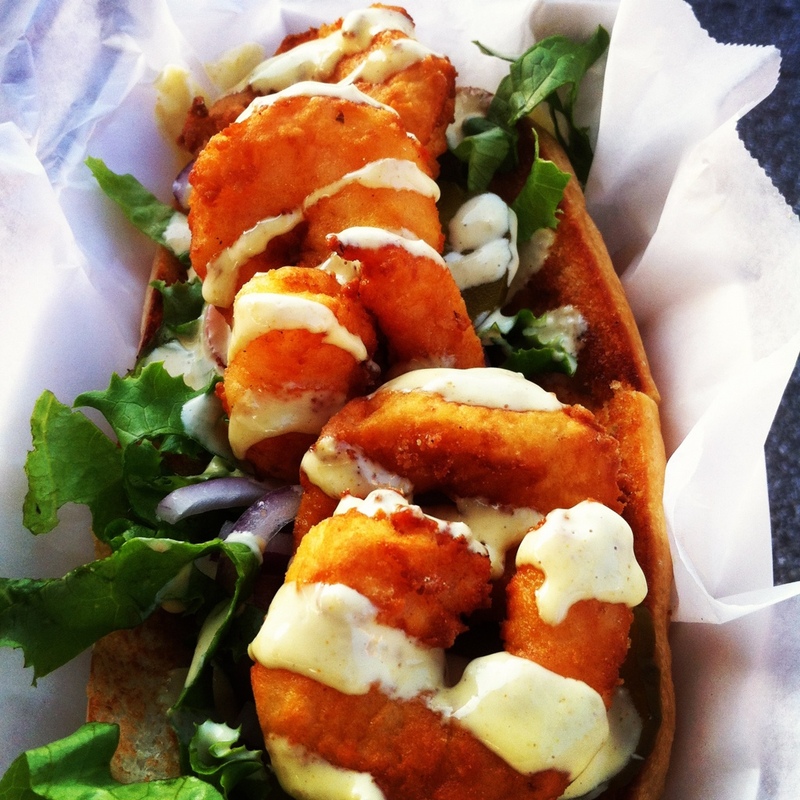 Alas, I quickly recovered from my disappointment and ordered a shrimp po’boy with a garlic aioli from Keepin’ It Reel that was messy, but delish. Alex meanwhile, tried a fried chicken alfredo burrito with aioli from a fusion type food truck that she said was life changing. Once we finished all the eating, we enjoyed the fun music (not sure who was performing, but it involved quite a range of classic songs from country to classic rock) and stopped to see some of the non-food tents and stalls that were set up down Corey Ave. We even stopped to watch a seven foot python wrap itself (in a friendly way, according to the handler) around some nervous kids as their parents and passersby snapped pictures. I tried to get Alex to hold the snake, but she seemed unwilling to get within five feet of it. There was quite a crowd waiting to get squeezed hugged by it, so we decided to call it a night. It was a nice end to the week though and Alex assured me that she had a great time despite being super full and worried she’d have nightmares about snakes. I went home and promptly went to bed. All the eating was exhausting. 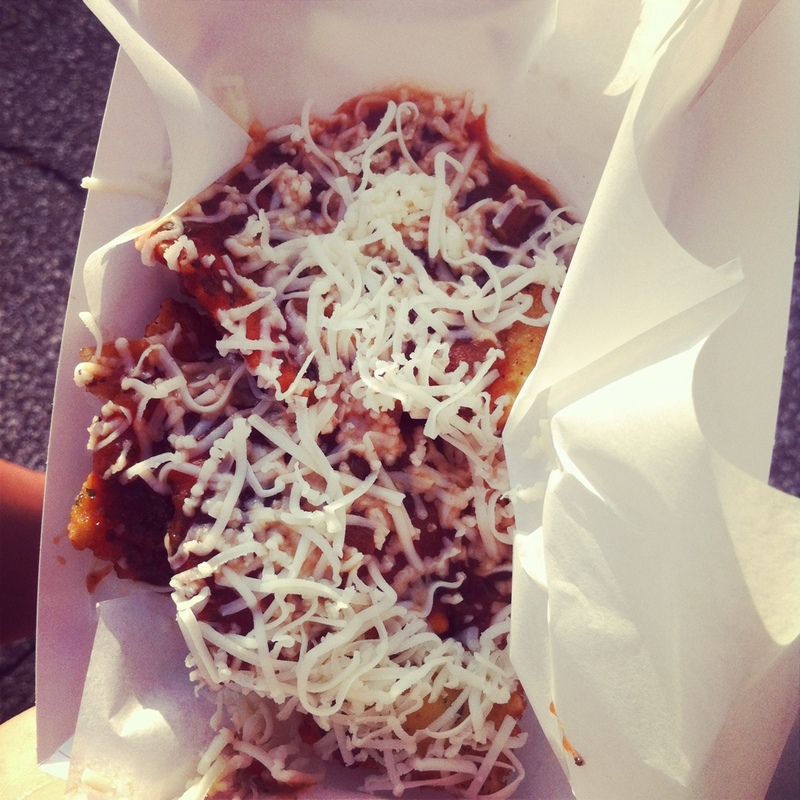 When was the last food truck rally/festival you went to? What was your favorite part? « Birthday-Month Recap Part I – Resort Stay-cation!